This article reviews the following such patterns: small sharp spikes (SSSs), wicket spikes, 14- and 6-Hz positive spikes, phantom spike and waves, psychomotor variant, subclinical rhythmic EEG discharges of adults (SREDA), and midline theta rhythm. Go to Epilepsy and Seizures for an overview of these topics. 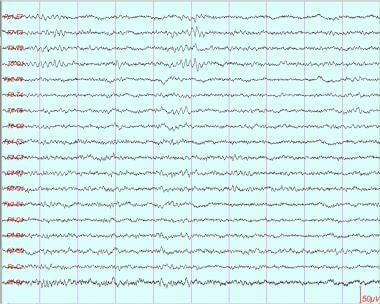 Small sharp spikes (SSSs), also known as benign epileptiform transients of sleep (BETS), occur in light sleep (stages I and II of nonrapid eye movement [NREM] sleep), usually sporadically. Their location is temporal, either unilateral or bilaterally independent, and with a broad field of distribution. The morphology is typically monophasic, occasionally diphasic, and the decline after the first negative peak is very steep. SSSs rarely may have a single aftergoing slow-wave component but generally do not disturb the background. The main features of SSSs are expressed in their name: their duration is short, and their amplitude is small. An easy guideline states that SSSs generally should last less than 50 milliseconds and should be smaller than 50 µV (see the images below). Small sharp spike is present in left temporal region (modified double banana montage). Note widespread field of distribution (isopotential at F7, T1, and T3), low amplitude (&lt; 50 µV), and short duration (&lt; 50 ms). Left temporal small sharp spike. Note low amplitude (&lt; 50 µV) and short duration (&lt; 50 ms). Small sharp spike is present in right temporal region. Note low amplitude (&lt; 50 µV) and short duration (&lt; 50 ms). Wicket spikes occur both in the awake state and in light sleep. Their frequency is 6-11 Hz, and they usually occur in short runs (wicket rhythm) but may also appear as single sharp transients. The location is temporal, usually bilateral and independent. The morphology is archlike or mu-like, sharp, monophasic, and not followed by an aftergoing slow wave. The amplitude may be high, but the transient arises out of an ongoing rhythm and does not stand out (see the images below). Wicket spikes in left temporal region. Note sharp transients arising out of ongoing rhythm and symmetric upslope and downslope, giving wicket morphology. Both 14- and 6-Hz positive spikes are observed predominantly during light sleep. These spikes usually appear in short runs lasting less than 2 seconds, and their frequencies, as the name indicates, are 14 Hz and 6 Hz. The location is mostly posterior temporal, either unilaterally or bilaterally. The morphology is a sharply contoured positive spike alternating with rounded negative component. The amplitude is medium, around 20-60 µV. The 6-Hz phantom spike-wave pattern may be observed in both adolescents and adults. It generally occurs during relaxed wakefulness and stage I sleep and disappears during deeper levels of sleep. The frequency is 6 Hz, as the name indicates, and the bursts last 1-2 seconds. The location is usually diffuse, bisynchronous, and relatively symmetric. This pattern may predominate in the anterior and posterior head regions. The morphology typically consists of a small (< 30 µV and < 30 ms), evanescent diphasic spike followed by a higher (50-100 µV) slow wave component. Thus, the spike component may be difficult to see. Rhythmic midtemporal theta of drowsiness (psychomotor variant). Note seizurelike rhythmicity and notched morphology. Subclinical rhythmic electroencephalographic (EEG) discharges of adults (SREDA) is an uncommon pattern observed mainly in older persons (>50 y). It may occur at rest or during drowsiness. Superficially, SREDA resembles an EEG seizure pattern. The frequency is typically 5-6 Hz. The location is widespread or bilateral with a posterior maximum. The morphology is seizurelike (ie, rhythmic sharply contoured theta). Abrupt onset and termination may help distinguish SREDA from an EEG seizure. The duration ranges from 20 seconds to minutes (average, 40-80 s). Midline theta rhythm (ie, Ciganek rhythm) may be observed during wakefulness or drowsiness. The frequency is 4-7 Hz, and the location is midline (ie, vertex). The morphology is rhythmic, smooth, sinusoidal, arciform, spiky, or mu-like. 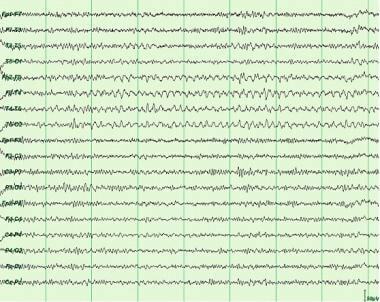 As a whole, these normal variants must be differentiated from epileptiform discharges (see Generalized EEG Waveform Abnormalities). In general, the benign patterns lack the characteristics of pathologic epileptiform discharges—that is, the high amplitude and aftergoing slow wave or suppression that make epileptiform discharges “disturbing” to the background activity. By default, assume that sharp transients are benign variants, and consider them epileptiform and abnormal only if they do not meet criteria for any benign transients. Small sharp spikes (SSSs) are generally easy to distinguish from spikes because of their short duration and small amplitude. Psychomotor variant (rhythmic midtemporal theta of drowsiness [RMTD]) differs from a seizure discharge in that it is usually a monomorphic or monorhythmic pattern that does not evolve into other frequencies or waveforms, as usually occurs during seizures. What are epileptiform normal variants on electroencephalographic (EEG)? 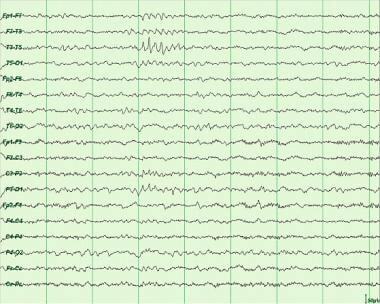 What are the EEG characteristics of the small sharp spikes (SSSs) epileptiform normal variant? 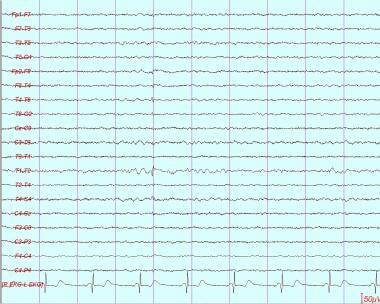 What are the EEG characteristics of the wicket spikes epileptiform normal variant? What are the characteristics of the 14-Hz and 6-Hz positive spikes epileptiform normal variant? What are the characteristics of the 6-Hz phantom spike-wave epileptiform normal variant? 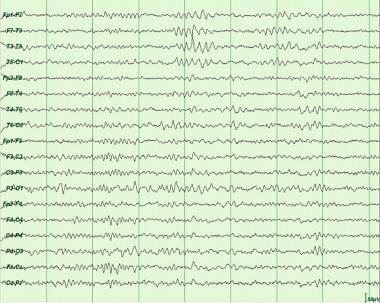 What are the EEG characteristics of the psychomotor epileptiform normal variant? What are the characteristics of subclinical rhythmic electroencephalographic (EEG) discharges of adults (SREDA)? What are the characteristics of the midline theta rhythm epileptiform normal variant? How are epileptiform normal variants differentiated from epileptiform discharges? Pedley TA. EEG pattern that mimic epileptiform discharges but have no association with seizures. Henry CE, ed. Current Clinical Neurophysiology: Update on EEG and Evoked Potentials. New York, NY: Elsevier Science; 1980. 307-36. Gibbs EL, Gibbs FA. Atlas of Electroencephalography. Cambridge, Mass: Addison-Wesley; 1952. Vol 2: 346-58. Gibbs EL, Gibbs FA. Electroencephalographic evidence of thalamic and hypothalamic epilepsy. Neurology. 1951 Mar-Apr. 1(2):136-44. [Medline]. Grossman C. Laminar cortical blocking and its relation to episodic aggressive outbursts. AMA Arch Neurol Psychiatry. 1954 May. 71(5):576-87. [Medline]. Kellaway P, Crawley JW, Kagawa N. A specific electroencephalographic correlate of convulsive equivalent disorders in children. J Pediatr. 1959 Nov. 55:582-92. [Medline]. Nidermeyer E, Croft JR. Uber die bedeutung der 14 and 6 per sec positiven spitzen im EEG. Archiv fur phychiatrie und Nervenkrankeiter (Berlin). 1961. 202:266-80. Walter WG. Epilepsy. Hill D, Parr G, eds. Electroencephalography: A Symposium on Its Various Aspects. London: McDonald & Company; 1950. 228-72. Reiher J, Lebel M. Wicket spikes: clinical correlates of a previously undescribed EEG pattern. Can J Neurol Sci. 1977 Feb. 4(1):39-47. [Medline]. 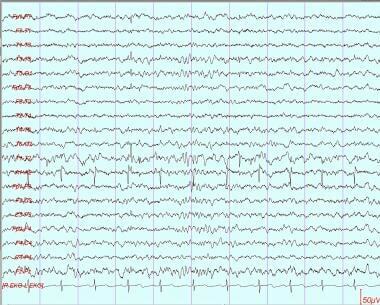 Ciganek L. Theta-discharges in the middle-line—EEG symptom of temporal lobe epilepsy. Electroencephalogr Clin Neurophysiol. 1961. 13:669-673. White JC, Langston JW, Pedley TA. Benign epileptiform transients of sleep. Clarification of the small sharp spike controversy. Neurology. 1977 Nov. 27(11):1061-8. [Medline]. Klass DW, Westmoreland BF. Nonepileptogenic epileptiform electroencephalographic activity. Ann Neurol. 1985 Dec. 18(6):627-35. [Medline]. Gibbs FA, Gibbs EL. Fourteen and six per second positive spikes. Electroencephalogr Clin Neurophysiol. 1963 Aug. 15:553-8. [Medline]. Garvin JS. Psychomotor variant pattern. Dis Nerv Syst. 1968 May. 29(5):307-9. [Medline]. Gibbs FA, Rich CL, Gibbs EL. Psychomotor variant type of seizure discharge. Neurology. 1963 Dec. 13:991-8. [Medline]. Lombroso CT, Schwartz IH, Clark DM, et al. Ctenoids in healthy youths. Controlled study of 14- and 6-per-second positive spiking. Neurology. 1966 Dec. 16(12):1152-8. [Medline]. Hughes JR, Schlagenhauff RE, Magoss M. Electro-clinical correlations in the six per second spike and wave complex. Electroencephalogr Clin Neurophysiol. 1965 Jan. 18:71-7. [Medline]. Marshall C. Some clinical correlates of the wave and spike phantom. Electroencephalogr Clin Neurophysiol Suppl. 1955 Nov. 7(4):633-6. [Medline]. Thomas JE, Klass DW. Six-per-second spike-and-wave pattern in the electroencephalogram. A reappraisal of its clinical significance. Neurology. 1968 Jun. 18(6):587-93. [Medline]. Miller CR, Westmoreland BF, Klass DW. Subclinical rhythmic EEG discharges of adults (SREDA): Further observations. Am J EEG Technol. 1985. 25:217-224. Mokran V, Ciganek L, Kabatnik Z. Electroencephalographic theta discharges in the midline. Eur Neurol. 1971. 5(5):288-93. [Medline]. Westmoreland BF, Klass DW. Midline theta rhythm. Arch Neurol. 1986 Feb. 43(2):139-41. [Medline].